After a year—or longer—you may have forgotten about your initial security deposit. Inevitable wear and tear will happen over time—most of the time wear and tear that is unintended or unexpected. Also, considering how busy—and distracting—moving can be, you may not have enough time to repair your place before leaving. Instead, it’s best to follow these tips for getting your security deposit back—and make sure that you keep them in mind a prior to your move-out date. Take pictures when you move in. This is one of the tips for getting your security deposit back that you should do right when you move in—not just before your lease is up. If you see any issues or wear and tear on your apartment, take pictures. That way, you can document any existing issues so your apartment complex will not blame it on you when it’s time for you to move out. Regularly tidy your apartment. Cleaning up your apartment before the move-out date is a daunting task. Make it easier on yourself by regularly tidying up your apartment each week. If you see lightbulbs that need replacing or any other simple jobs, try and deal with that sooner rather than later. Then, you won’t be in a frenzy to fix everything as you’re packing up your boxes. Do a deep clean when it’s time to move. Mop the floors, dust the apartment, and scrub away messes. Not only will this make it easier for you to get your deposit back, but you can rest peacefully knowing that the next tenant will thank you for your hard work. Hire a cleaning service. Too busy to clean? Need a bit of assistance? Hire a cleaning service to help you out. Many services offer add-ons, like bathroom deep cleans and stove cleaning, too. So, if there’s one particular area that you need a helping hand with, enlisting a professional will make getting your deposit back so much easier. Keep your renter’s agreement handy. Not only will you know what’s expected of you, but you can better prepare for move-out if you have your renter’s agreement handy. Read it thoroughly, ensuring that you follow its requirements. Ask your apartment complex. Whether you have a question about move-out cleaning or you’d like someone from your apartment complex to do a pre-move inspection. They’ll appreciate your diligence, and you’ll know just what you need to do to get your deposit back. Enlist help from your friends. Most likely, you’ll be asking friends or family to help you move. Why not ask them to take a look through your apartment? They may find issues or messes that you’ve missed. Additionally, if you’re worried about asking your friends, offer to check through their apartments too when they move. That way, you all benefit. As it’s time to bid adieu to your old place, don’t say goodbye to your security deposit. It’s up to you to leave your apartment just as clean as you found it. Thankfully, the task isn’t as terrifying as it sounds. With these tips for getting your security deposit back, you can move out successfully—and enjoy that extra bit of cash. Hoping to find a wonderful new apartment to move into? Check out our website. Plus, for more on apartment living, check out our blog. 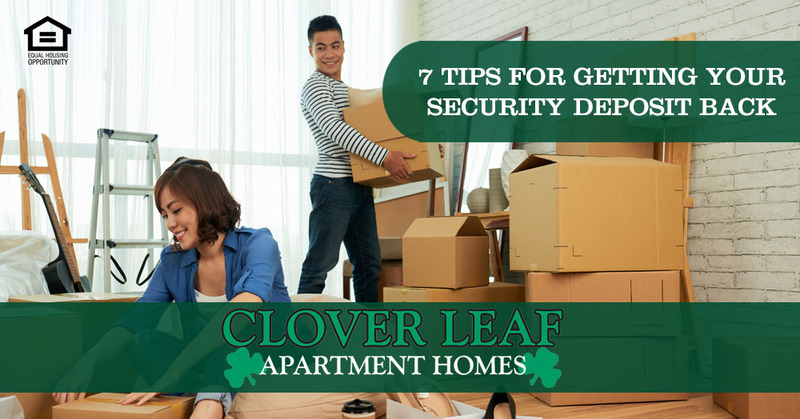 This entry was posted in Clover Leaf Apartment Homes, Phenix City Apartments, Security Deposit and tagged tips for getting your security deposit back. Bookmark the permalink.